A carpet stretcher, also called a power stretcher, is an essential tool for installing wall-to-wall carpet. This is because carpeting is not just laid onto the floor; it's actually stretched and hooked onto tack strips along the edges so the carpet backing is taut. This enables the carpet to lie flat without lumps, bumps, and loose areas. If you're considering tackling the job yourself, you'll have to rent or buy these essential tools and learn how to use them. Here are some of the most common questions DIYers have about the project. Is it Worth it to Buy a Carpet Stretcher? Most likely the answer is no unless you're planning to go into the carpet business or you're up for installing carpet in an entire house and don't want the time pressure of a rental. Quality carpet stretchers are out of reach of most DIYs. 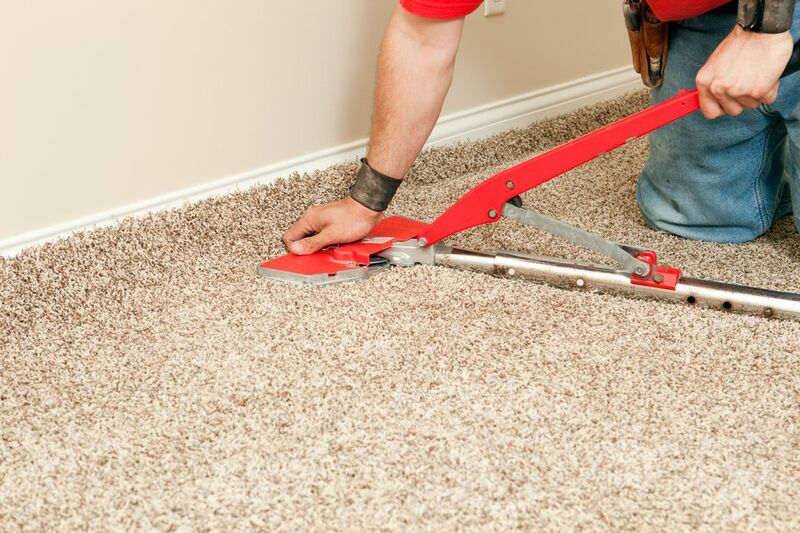 Less expensive carpet stretchers will not perform as expected, leaving the carpet wrinkled and bumpy. At the time of writing, decent-quality power stretchers start at about $500. Professional-grade sets are pricier. As with everything Harbor Freight-related, though, you can purchase one there for about $50, but that's for a very simple version of the tool. If you're serious about buying a carpet stretcher, be sure to compare what's included in each set. Better sets have more extension tubes for greater reach. Can I Rent One? If So, How Much Does It Cost? Large rental outlets rent a basic power stretcher for about $30-$40 per day or $125 per week. Rental of a basic set usually doesn't include a knee kicker tool for stretching carpet on stairs and other tight spaces; see below. A knee kicker rents for about $17-$20 per day. Keep in mind that for novice carpet installers, one extra day should be factored into the rental period to allow for the learning curve. Can I Get By With Just a Knee Kicker? No. ‘Getting by’ with a knee kicker is analogous to sanding a wood floor with a hand sander instead of a floor sander. The knee kicker performs a function of carpet stretching that the larger power stretcher does not do, and vice-versa. Carpet installers use both power stretchers and knee kickers in their work, and most carpet installations require both tools. Can I Revive Existing Carpet With a Carpet Stretcher? Carpet stretchers aren’t just for installing new carpet. If you’ve got old, wrinkled and bubbled-up carpet, it is possible to rent a power stretcher to smooth down and “revive” your carpet, extending its life by a few years. Is It Better to Hire a Real Carpet Installer Instead? You can do the math, but in most cases, professional installation is worth the price. If you're willing to remove all of the furniture and cut up and dispose of the old carpet and padding, you can get a carpet installed for about $3-$6 per yard for standard carpet (Berber and some other types cost more to install). Having a pro get rid of the old carpet might cost an additional $4 per yard. The other factor is quality: no matter how handy you are, if you're not experienced with carpet you won't get the same results as a good pro. Where to Rent or Buy? Local rental outlets, as well as most big-box home improvement stores, rent carpet stretchers, knee kickers, and some hand tools, such as stair tools and seam cutters. Home improvement stores typically carry one brand of carpet stretcher for sale, along with a basic selection of hand tools. If you want to invest in a quality stretcher or need any special tools, you can find everything you need at a good local flooring supply dealer, where the pros shop. Should You Upgrade the Builder's Carpet? How Can You Tell the Quality of a Carpet? What Does Solution Dyed Mean and Why Should You Care? Do You Really Need a Pad Under Your Area Rug?